Boiling our pots of soup at 97 Hot Pot. As a Chinese girl who was born and raised in Edmonton by my parents, far away from the rest of our immediate family, we would eat Chinese food when I was growing up, but I much preferred things like pizza, pasta and the like over traditional Asian fare. I’d happily go to Chinatown to eat sweets like pineapple buns, and, of course, to shop for all things Sailormoon. That was pretty much the extent of it. It has always been that way for me. If I ever had the option to have anything other than Chinese food, I’d take it. Yet, that mentality has changed over the years. By all accounts, Chinese cuisine still isn’t my favourite; however, I do love a good Peking duck, or freshly made shumai and cocktail buns at what I like to call “Asian brunch” as we usually partake in dim sum late in the morning and on the weekend. So, now that I’m older and more willing to try everything, when my parents suggested going for a hot pot lunch on a chilly December day, I thought I had better give it a go. I really should refrain from being picky nowadays. 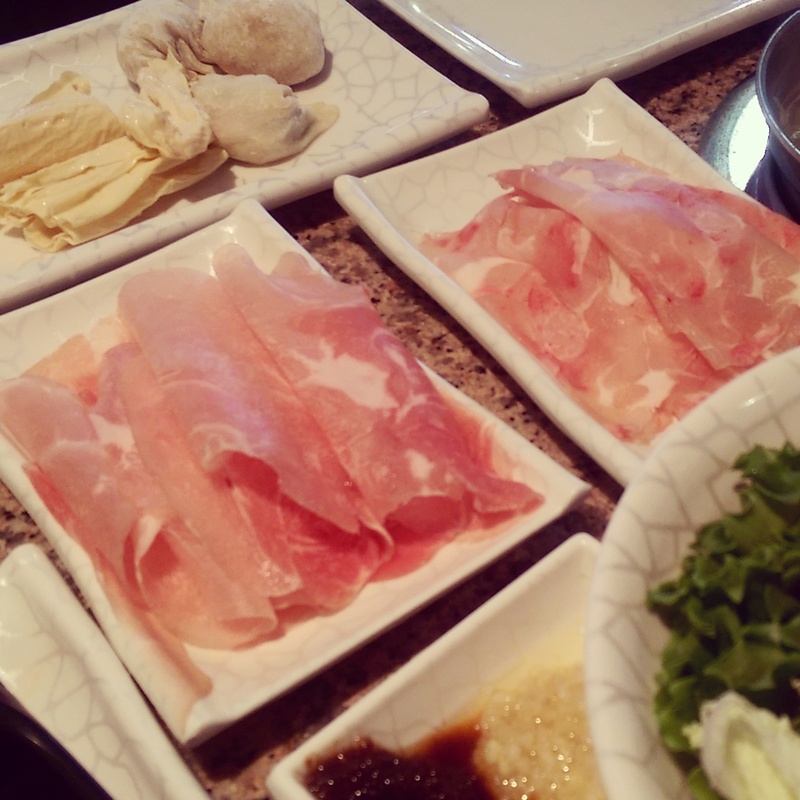 Raw chicken and pork slices, bean curd, dumplings and sauce. Years since I had had that type of meal – essentially you get boiling hot soup and you cook raw veggies and meat at the table yourself (it actually sounds a lot like The Melting Pot from what I’ve been told) – I figured it was time to open myself up to my heritage. After all, hot pot is the Chinese equivalent of bringing family together. 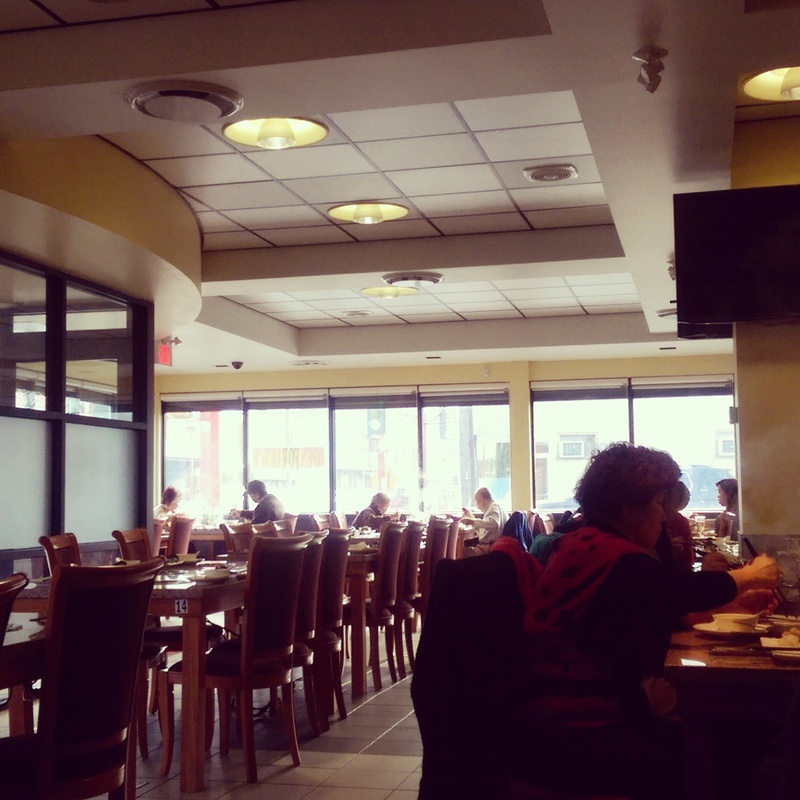 We ended up at 97 Hot Pot, a somewhat newer establishment in the heart of Chinatown. The location used to be home to a small grocery store, but has been renovated into a spacious, bright and clean restaurant. 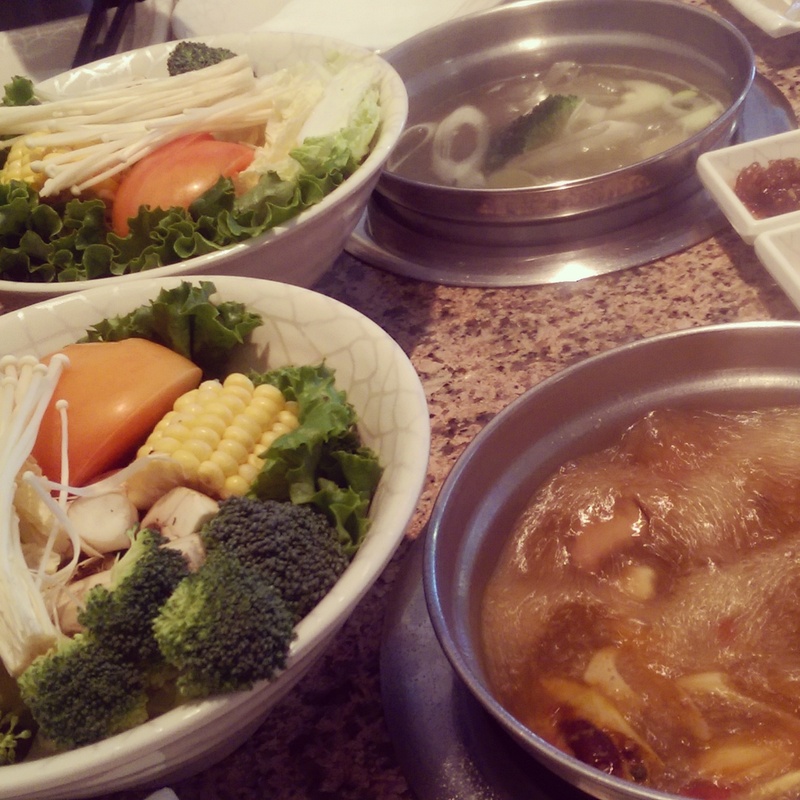 Tables have individual hot pot plates built into them, so each diner can pick a soup base of their choice. The temperature settings of the heating plates can be changed (on a scale from 1 to 3), allowing patrons to adjust them as needed. The interior of 97 Hot Pot. They offer an all-you-can-eat option at 97 Hot Pot, but the lunch menu is more than enough for each person. At around $13 each, there’s plenty of food to ensure you don’t leave hungry. Using the paper menus, we checked off what we wanted, which includes one type of broth along with five entree items. All of us selected different things, but I went with the Szechuan Spicy Chicken soup, sliced sirloin beef, pork wontons, pork & vegetable dumplings, beef balls and vermicelli noodles. Another bowl of fresh veggies (lettuce, tomato, corn on the cob, enoki mushrooms, white button mushrooms and broccoli is provided as part of the price. My Szechuan Spicy Chicken soup before it started to heat up. A bowl of vermicelli noodles along with sliced sirloin beef, dumplings, wontons and beef balls. First off, let me say that the Szechuan Spicy Chicken soup is SPICY! I love food with a good amount of heat, but, for me, this was more than I expected. On the one hand, I didn’t have to use any additional sauces to flavour my soup and food. On the other, it was spicy enough to take away some of my ability to taste anything else. This soup is made with a number of ingredients, many of which I couldn’t quite pick out, but can be seen in the pot. One flavour in particular was hard for me to pinpoint, but I’m sure it came from some sort of re-hydrated veggie or bean, which is often used in Asian soup bases, and not one I’m that fond of. Nevertheless, it was still yummy, and, if you have a penchant for extremely spicy food, this might be for you. I liked that they didn’t skimp on the extra bowl of vegetables because it could be a meal in itself. Regardless, I’m glad to have the additional entree items. The sirloin beef slices were fresh, the beef balls had a nice spring to them once cooked, the dumplings were plump and juicy, and the vermicelli, which soaked up just the right amount of flavour from the soup, helped to fill my belly. The only misstep of my meal was the tiny wontons. Although several were provided and they were tasty, they were much smaller than regular wontons that are to be had anywhere else. Also, if I had a do over of my lunch, I would maybe have gone with the rice noodles instead. Thick, clear and kind of gelatin looking, I sampled one from my mom’s plate, and they were delicious. 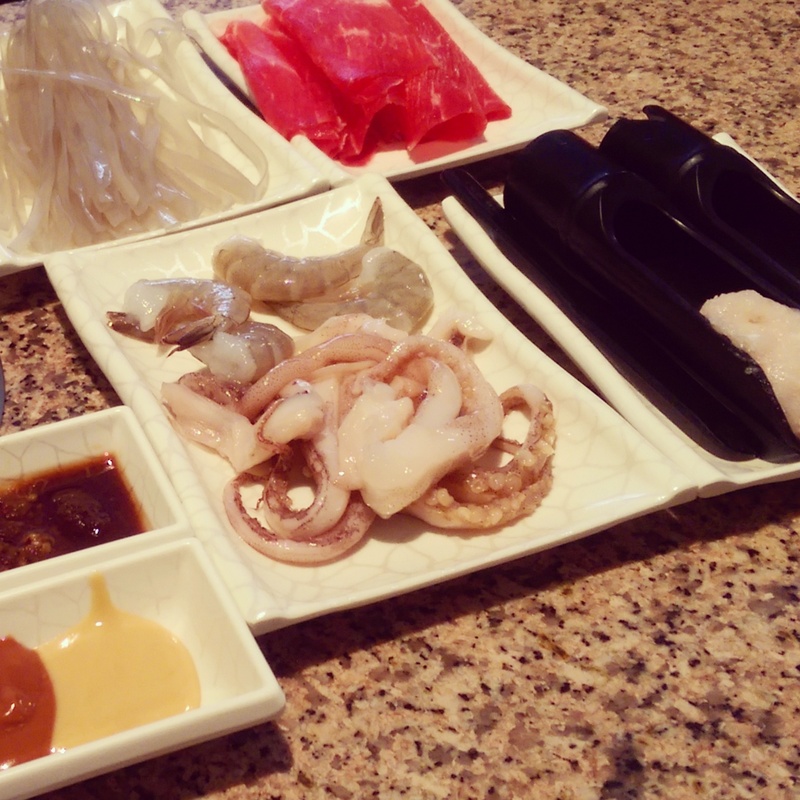 My mom’s selection of rice noodles, sliced sirloin beef, shrimp, squid and fish. With regards to the service, it was busy that day and they don’t have many people on staff, so I would say that they could improve in that aspect. Both my mom and I still had some food to cook, but our soup had boiled down until there was very little left in the pot and you could smell a bit of the food burning. We had to wave a staff member down to get them to add water to our pots before we could continue with our meal. All-in-all, I enjoyed the food and the outing. It’s a fun, communal type of meal that is as traditional Chinese as one can get.